Is the DVD-by-Mail Industry Growth Slowing? Citi Investment Research analyst Tony Wible said in a Monday client note that he expects Blockbuster's earnings report to indicate a slowdown in the online rental industry. This would be a positive for Blockbuster as it makes significantly more money from in-store rentals, Wible said. Barton Crockett of JPMorgan Securities said his analysis of in-store video rental revenue data for the industry indicates Blockbuster's rentals were likely soft in the quarter. He predicts a third-quarter loss of 19 cents per share on revenue of $1.27 billion. Wedbush Morgan Securities analyst Michael Pachter predicts a quarterly loss of 21 cents per share on sales of $1.23 billion. "We believe Blockbuster lost approximately 150,000 subscribers this quarter, ending with 3.45 million subscribers (down from 3.6 million in the second quarter)," he wrote in an Oct. 16 client note. If Blockbuster lost 150,000 customers in Q3, and Netflix gained around 280,000, that means that the online DVD rental market grew by less than 150,000 customers in Q3. Netflix is predicting that they will add 300,000 - 500,000 subscribers in Q4, but I wonder if Blockbuster (now focused on retail and spending much less on marketing) will offset the industry growth by losing more customers in Q4. The Washtington Post takes a look at Netflix's online strategy, Waiting for Netflix's Plot to Advance. "It's like a three-act play, and we're in the opening minutes of the second act," says Steve Swasey, vice president of corporate communications at movie-rental Web site Netflix, as he gives a tour of the company's Rockville processing center. Act 1, as far as the company is concerned, was getting people used to renting DVDs over the Internet. Act 3 is "no more DVDs and everything is online." As the curtain rises on Act 2, the world is somewhere in the middle. Tech companies, including established retailers such as Amazon.com and start-ups with names like Vudu, have been tripping over themselves to figure out how to hook up the living-room TV to the home's high-speed Internet connection. Interesting tidbit from the story, on how Netflix determines what movies to keep at a shipping center: "If a movie goes too long without a rental, it gets sent back to a central warehouse. But if a Washington area subscriber has a movie in his or her queue, it stays. You think you've taken a long time to return a movie to Netflix? Netflix's Steve Swasey, talking about renting Hotel Rwanda: ""I've had it for eight months," Swasey confessed. "I just can't bring myself to watch it because I know it's going to be depressing." Update: Hulu is generating a lot of positive buzz, including coverage by The New York Times, paidContent, and Macworld (thanks, David). Hulu is a free service that lets you watch full episodes of NBC shows such as Heroes, Bionic Woman, The Office, and 30 Rock for free online, including past episodes. 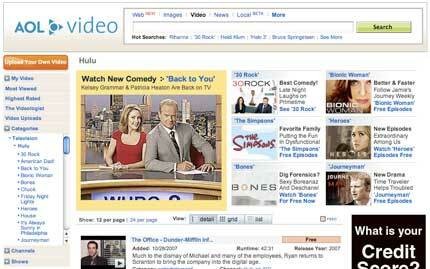 This is part of a new trend to enable viewers to catch up on older episodes of shows through ad-supported viewings. A percentage of Netflix's viewership is TV shows, but the studios will hold back previous seasons for DVD sales, so Netflix should not be impacted by these offerings. On a Tuesday morning, I received the typical email that my movies had been received by Netflix. Great. Usually, that means Wednesday or Thursday's mail will have new movies for me. Not the case here. On Friday night, my queue still said "we expect to ship your next available movie by Monday". Now, I had over a dozens movies that had been listed as "available now" ever since they received my stuff earlier in the week. Very curious (and disappointed), I called them up to see if I could get an explanation. The customer service rep was very friendly, but couldn't offer any possible reason as to why it was taking them a week before they even shipped out new discs. Without my even asking for anything, he said that they'd be adding a bonus disc to my next shipment, and that my next month of service would be on the house. He even made a comment about a movie I had recently rented, and we chatted about our personal favorites for a minute. Has anyone else had trouble with Netflix shipping movies? Have you had an outstanding customer service experience with Netflix or Blockbuster? A bad experience? Would You Rent or Buy a Kiosk-Burned Movie? Would you buy or rent a movie that was burned in a retail store, such as Wal-Mart or Walgreens? Reuters reports that we are very close to having DVD-burning kiosks in retail stores. "We hope to launch DVD-burning kiosks in the next few months. We think its a type of solution that will work very well in our stores, giving us the ability to provide a virtual inventory to a diverse customer base," said Tiffani Bruce, a spokeswoman for Walgreen, the nation's largest drugstore chain, with more than 6,000 stores. Last month, the DVD Copy Control Association, a group of movie studios and hardware makers that oversees the copy protection system for DVDs known as Content Scramble System (CSS), moved to allow its technology to be licensed more broadly, opening the door for DVD-burning kiosks. Now Walgreen is working with Hollywood studios and consumers will be able to make DVDs in about 15 minutes. Blockbuster is very interested in the technology: ""The burning capability is a perfect complement to our Movielink download business, because it will eventually enable consumers to store movies on their hard drives or DVDs for future usage," said Blockbuster spokesman Randy Hargrove..
Netflix and Blockbuster both make it very easy to change the number of movies you have out at a time, and you can upgrade or downgrade your account through the "account" setting page. In September I upgrade to the Netflix 4-out plan, and kept it through October. I already have a 3-out plan with Netflix & Blockbuster, and I don't watch that many movies, so I decided to downgrade my account to the 3-out plan. The process to upgrade and downgrade was quick and easy, and Netflix even warned me that I have to return enough movies to create an open slot in my queue because of the downgrade. Have you upgraded or downgraded your account? What was the experience like? What plan on you on now? Click here for the full list of new releases this week (154). Interesting movies this week include Spider-Man 3, License to Wed, Captivity, In the Land of Women, Talk to Me, El Cantante, No End in Sight, Day Watch, The Devil Came on Horseback, Pierrepoint, Journey from the Fall, Modern Marvels: Engineering Disasters: New Orleans, Biography: Saturday Night Live, and Cities of the Underworld: Season 1. 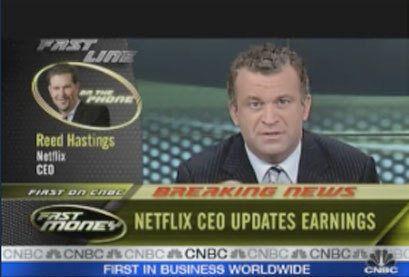 Netflix CEO Reed Hastings was on the CNBC show Fast Lane earlier this week, where he discussed Netflix's performance last quarter. Advertising Age reports that Time will launch Maghound early next year, a magazine subscription service that charges a flat rate and lets you change your subscriptions at will. After years of development, Time Inc. plans to introduce an online service next year that will offer pay-as-you-go, mix-and-match, highly flexible magazine subscriptions from a variety of publishers. Consumers using the service, to be called Maghound, will be able to pay one monthly fee for three subscriptions, with the ability to swap one title out for a new one or cancel entirely at any point. Group movie watching experiment We Talk During Movies will be viewing the first four episodes of Alfred Hitchcock Presents: Season 1 at a new time, 7:30pm CST.